← Ah ha!….the mouse got the cheese! in learning to understand my own thinking. a bit like a DA prosecuting an accused defendant…. 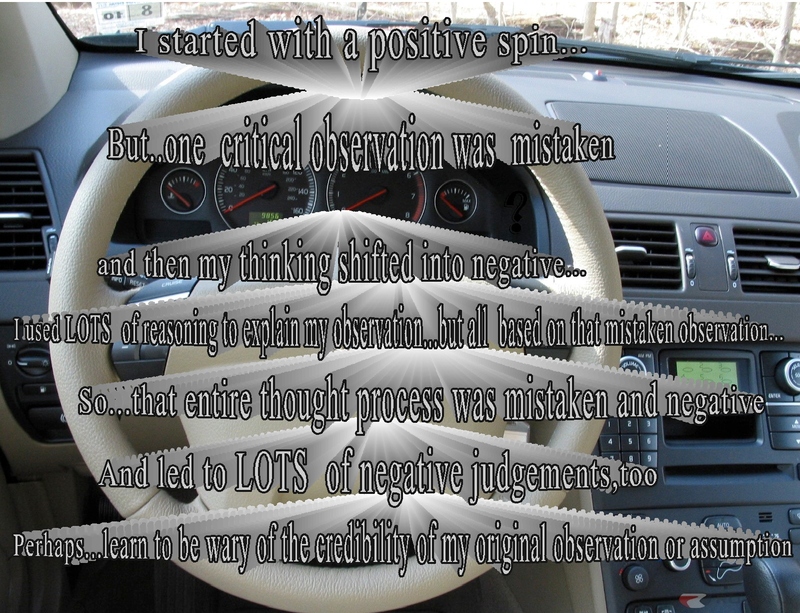 As a result of what I thought and learned, I came to have much more balanced perspective on my own thinking…to realize that my thinking is often limited….and….as most people do, I inflate the positive…..and expand on the negative…to the detriment, at times, of myself and those I care about. My husband (36 years together) just read through the draft of this post….I had a compilation of these pages on the wall for many months and he really appreciated my honesty and openness to changing….and he just walked off chuckling…ah ha, a husband’s/partner’s dream come true….acknowledgment of being mistakenly judged….and then, in that wonderful 11 year old boy’s voice said….. “she thought I was wrong…….. but I was right…….” awwwww….. such a special person…. This entry was posted in Mindfulness and tagged Awareness, Inspiration, Life, Mindfulness, Spirituality. Bookmark the permalink. Kathy, I was chuckling as I went along with you into the mis-gauging mental ride, as I have been there done, that. Did this just today! My nephew’s wife sent me a gift that was um… a challenge as the edibles she sent melted in the box as it was wrappred in a plastic bag, and it is from Thailand where thy live. LOL, But… I didn’t anything as she is sensitive and young so gave them my thanks and appreciated her being thoughtful. She was so happy with her gift and that was enough for me! Today, I recieved another box from her, with beautiful gifts, soaps, a sarong, a puzzle, dried fruits in sealed box and my first thought was she found out about her previous gift’s fiasco and was embarassased. In her culture they are very concerned about gift giving. I was actually struggling with this for a while, thinking just like you did, “sis must have forgotten and told them”‘ “now my niece in law is going to get discouraged.” Sis didn’t say antything to them, so here I created a mini mental concern over a beautiful gift. lol. Hi Marie…..ahhh….going on one of the mis-gauging rides…I’m all too familiar with those too….it’s good that you got that situation clarified…it’s continues to be such a surprise to me to “hear” my own thoughts at times. Great title for these cards, Kathy! And a wonderful lesson. When we look at the world through the clouded lens of past experience . . . images are distorted. We need to remember to STOP LOOK and LISTEN more and JUDGE less. 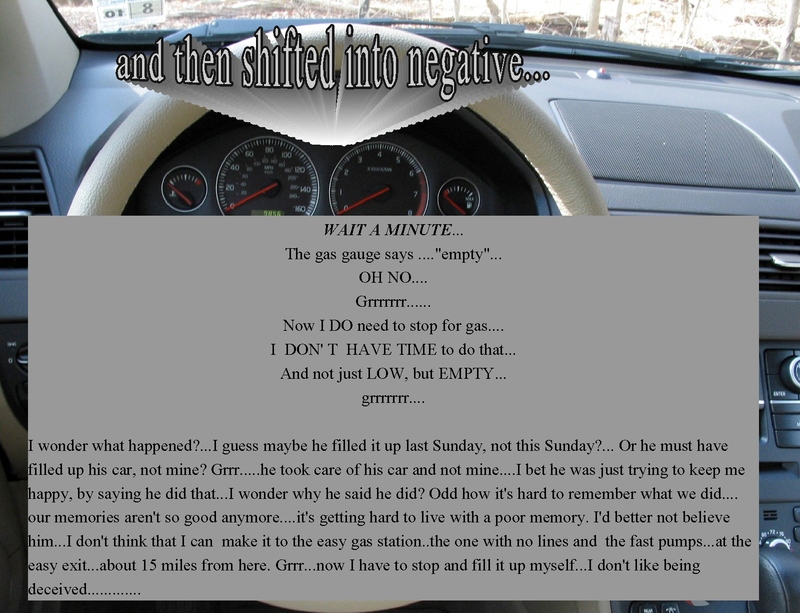 Thanks Nancy…I usually try to stay more in the “enhancing the positive” range…but I also try to keep in mind that coming to terms with less positive thinking can be helpful, too….at least it is for me…..and yes, as you write…judging less is key…. A person I love very much does this. She starts negative…I used to get sucked in…but now I just wait for her to figure things out, sometimes with a little coaching from me. Amazing how many times all things come up positive, isn’t it? Looking at my window gem…”Stop! Stop! I’m HAPPY now!” Thank you. oh excellent story and lesson. We let our thoughts just go round and round and spiral downward too many times. Oops, you caught me! This is one of my greatest weaknesses when I have overscheduled myself and hurry too much and think too little! 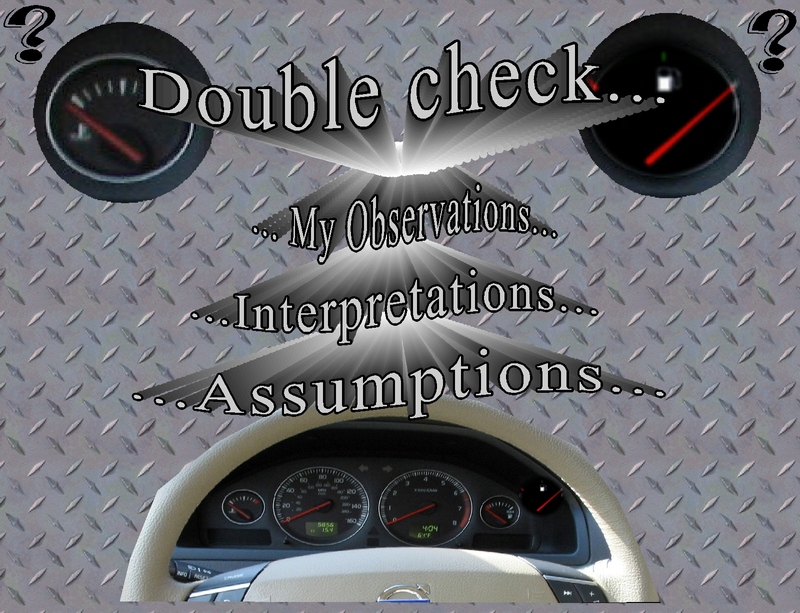 Double-Check is such a great guideline! Bless you for the graphics that will not allow this precept to escape my little brain anytime soon! Ah yes….”hurry too much and think too little…”….that’s a great way of phrasing that! And I used stamped metal as a background…partly to do with cars, but mostly to do with how imprinted my/our “habits of mind” can be…similar to stamped, imprinted metal…hard to smooth out, too….but, of course, it can be done…. Wonderful story that is so true to life for just about anyone. 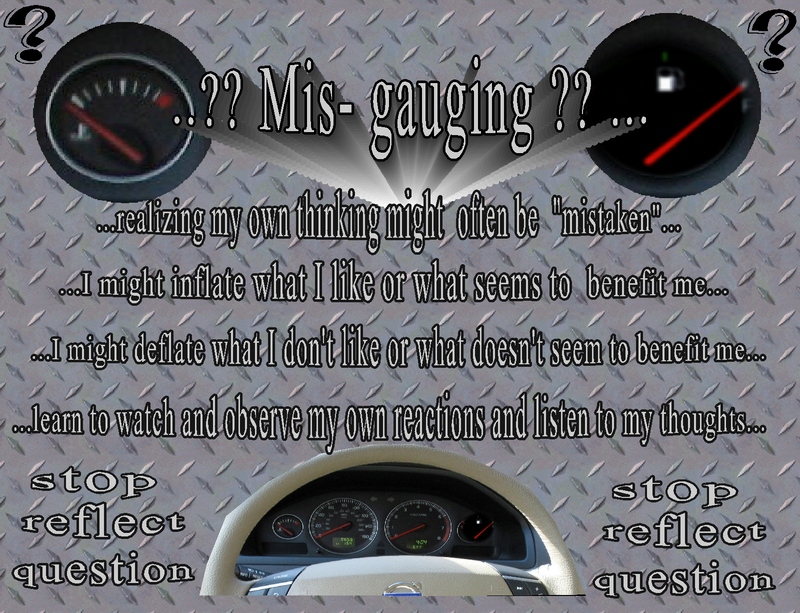 Not everyone, however, is willing to share how easily they mis-gauge, but we all do it. Thanks for such refreshing honesty. thank you Connie, It took a leap of courage to post this one…but I figured it’s helpful for me to attempt to be honest with myself and to look at any type of learning experience, whether positive or less than positive, and to learn from it… and that there might be others who might get some type or benefit from my awareness of mis-gauging.